iPod Dock Extender Lets You Dock With Your Skin On | OhGizmo! If you’ve decided to protect your iPod with a skin that’s any thicker than a thin sheet of paper, you’ve undoubtedly found out that docking your music player can become quite a pain. If it’s wearing leather, or something equally thick, it’s pretty much impossible without peeling the skin off first. So, leave it to the Sendstation guys to come up with an elegant solution. 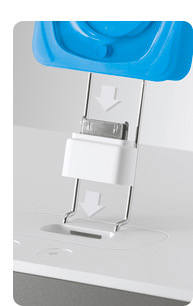 The Dock Extender simply connects to your iPod on one end, and to any dock on the other via an included standard size Dock Insert. There’s even a removable metal support for added stability. And, no need to remove your akin anymore. It’s a simple gadget, but one that promises to make your life marginally more comfortable; at least, your music-listenin’, iPod-totin’ pampered life, that is. There’s no word on price or availability, though we don’t expect this to be too far away. This is useless for anything that has a deep cradle like the inMotion IM7 or any other thing that uses a deep cradle. Not to sure why they created an extender with such limited use for most of us in need of one.